To see how various network testing devices stack up, it is helpful to compare their functionality and potential limitations side-by-side. 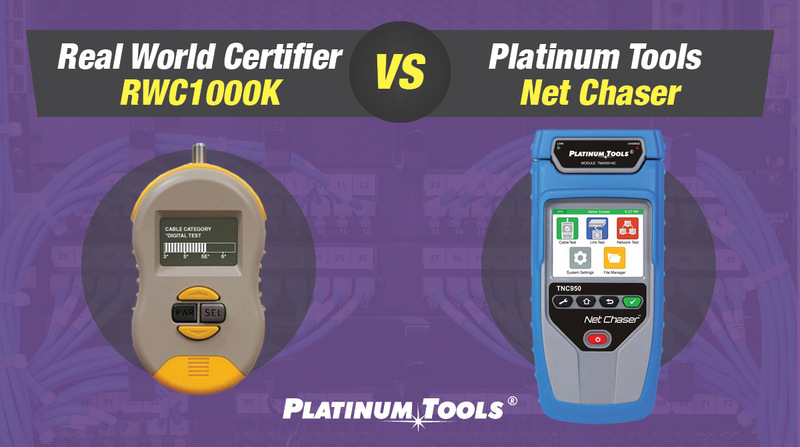 Here we compare the Real World Certifier RWC1000K against the Net Chaser by Platinum Tools. From the above, it can be seen that Net Chaser from Platinum Tools is capable of conducting a great many more kinds of network tests adding the capability to store those results. The biggest differences come in the cable testing category. The Net Chaser has an active remote to loop back the data tests (SNR, Skew and BER test). To measure any data with the RWC users must buy a GB switch to run any of these tests. Net Chaser features a vivid color display, which is not just a ‘nice to have’ feature – the clarity of your screen display is very useful working in field conditions. Finally, having the capability to perform key network tests such as detecting the presence and class of PoE make the Net Chaser the clear winner in this head-to-head comparison.